We awoke to snow, going sideways and up and all around. After breakfast, we bundled up in all the layers we had brought with us and headed out. 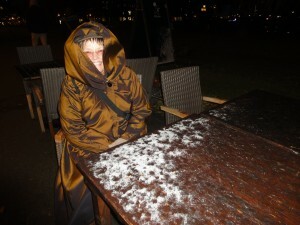 The wind was amazing; very little snow was falling and none was sticking, but the cold kept the pathways slippery. The walk was quite scenic, though we kept our heads down a lot! First off, it’s pronounced close to “Border”, named after Wilhelm Bode, the director of the sculpture collection at the Gemäldegalerie in 1872. The Bode perches on the upstream end of Museum Island and looks like it was built to fit the rounded end. It has a bridge right out front and a plaza. We had crossed this the other day on our inadvertent walking tour [looking for an entrance]. Today, however, the plaza was bleak and freezing, so we waited on the covered entry colonnade with a group of extremely excited first-graders and their keepers teachers. At last the door was unlocked and we found we were waiting at the wrong door. Once inside, we stripped off most of our clothes and backpacks and left it all in the cloakroom. 1. New York City has cloakrooms everywhere, free but for a tip. 2. In the South, people keep their houses very warm through the winter. We climbed the huge elegant stairway in the impressive entry rotunda, to the mezzanine level, where we found a charming lunch room and the bookstore. A superb bookstore, better than any so far; we bought the guidebook for sculpture and determined to return for another look. 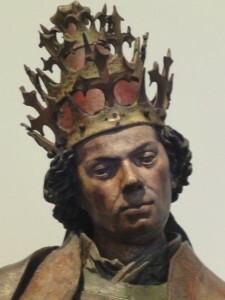 IMO, Medieval sculpture is a vastly underrated, ignored field of art. The naturalistic carved wood and sometimes stone was painted in lifelike colors. The statues that survive go back to the 11th century and grow in realism through the 15th, when you could say the Renaissance arrived, coming north from Italy. Of course, the theme is always religious, but even this allows a wide range of styles and subjects. So many Marys holding baby Jesus in every mood from cranky-cross, squirming, insipid, limp all the way to precious. Just like real babies, in other words. The one I liked the best, the baby looks like he is about to fling himself out of his mother’s arms and, since it was made to be displayed quite high on an altar, the urge to reach up to catch him is overwhelming. The Louvre in Paris has more carved ivory panels and reliquaries but the Bode had more free standing ½ life sized wood carvings with the paint still intact. 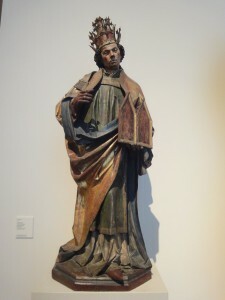 My understanding is that several artists worked on each piece, from the wood carver to the painter [who used darker shades to increase the shading, esp of the face] to the metal worker who added gems and gold [most of which are missing]. 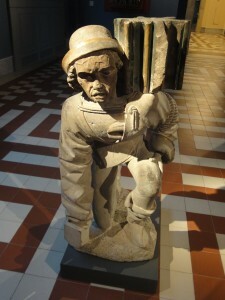 There is a wonderful figure, probably a portrait of the mason, supporting the pulpit. 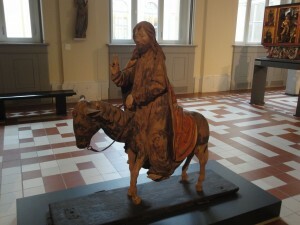 A delightful Jesus on a donkey, on wheels, that would have been used in holy day processions. 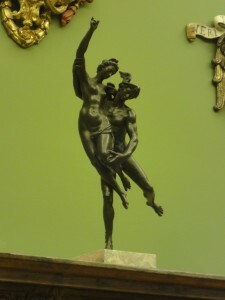 As the Renaissance gained ground, sculpture turned to Greek and Roman motifs. And all of a sudden, most folks are stark naked! Quite a contrast to the heavily robed northern European church statuary. 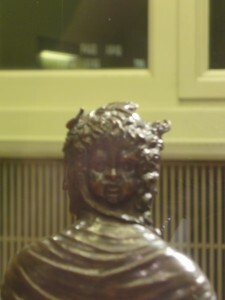 Bronze casting came in to favor in the Renaissance as the world relearned the art, spurred on by recent discoveries of classical examples, as well as expertise gained casting bells and cannon. 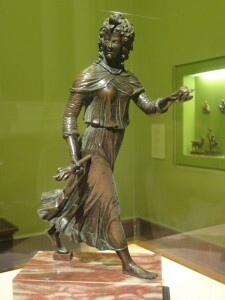 One striking example is a northern Italian bronze from 1500 of Hecate, where that goddess is striding along, with a burning heart in one hand and a torch in the other. She shows her three faces: virgin, mother and crone; her virgin face is quite young, but I’m not about to make a joke about the artist having to get a very young girl since no older virgins were to be found. We walked home in the snow, after dark. The wind was not as ferocious, so we stopped for a picnic. Actually, we went back to the BBQ place for a robust warm dinner.